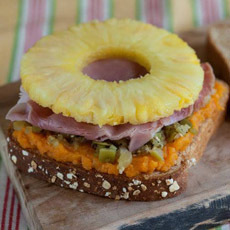 Aloha, Hawaii: a sandwich of ham, pineapple and mashed sweet potatoes (photo courtesy Arnold Bread). We baked the sweet potatoes in the microwave (4 minutes). They mash very easily. 1. PLACE 2 slices of bread on the work surface. Spread half of the mashed sweet potatoes on one slice of bread. Add 1 tablespoon salsa on top of the potatoes. 2. TOP with 1 slice of ham and 1 pineapple ring. Cover with the remaining slice of bread. Repeat for the second sandwich.